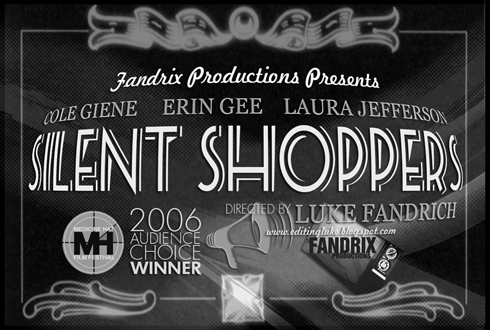 Silent Shoppers is a modern silent film that I made in 2005 that was inspired by watching shoppers scramble after Christmas. It's actually a re-edit from the original film I made in class, Yellow Tag Clearance, which was very similar but instead of being silent was more like a comic book. The original was made as part of my 3rd year core production, but this re-edit went on to win the Audience Choice award at the 2006 Medicine Hat Film Festival. All I really remember about shooting this day was that it was -30 C out so we could only work a few minutes at a time before needing to go into the mall to warm up. It was such a long day, but it remains one of the shooting highlights of my film school projects.